Darryl Dunn has been General Manager of the Rose Bowl in Pasadena since July, 1999. He is responsible for managing all aspects of the facility, including; contract negotiations for prospective events, ongoing relationships with existing tenants, the Tournament of Roses, UCLA football, all financial, marketing, operational needs for the stadium. Dunn also serves as the primary representative for the City of Pasadena to the African Gold Corporation regarding the operation of Brookside Golf Course, a 36 hole public golf course in Pasadena. 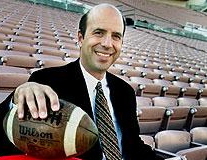 Prior to coming to the Rose Bowl, he worked for the Los Angeles Raiders, Los Angeles Clippers and the World Cup 1994 Organizing Committee.